The King's Musketeers were a guard unit put together by King Louis XIV. He was inspired by the heroic tales of the earlier Musketeers of his Fathers time. The King's Musketeers of the 1670s were no parade ground army though. They were a elite unit who led the attack in many battles and sieges throughout the French Dutch War. 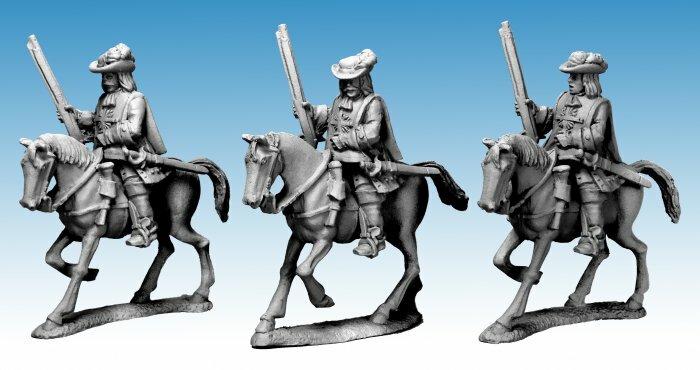 In times of war they would normally fight as a cavalry unit, these mounted figures armed with muskets depict the King's Musketeers in battle. 28mm sized figures, made of metal. supplied unpainted.